Evicted is that rare work that has something genuinely new to say about poverty. Desmond makes a convincing case that policymakers and academics have overlooked the role of the private rental market, and that eviction is a cause, not just a condition, of poverty.... Last year, New York City marshals quietly evicted more than 20,000 households. In Brooklyn housing court, the judges looked bored. The attorneys for landlords sometimes fell asleep. Evictions have become routine. Desmond's book should begin to change that. It is harrowing, heartbreaking, and heavily researched, and the plight of the characters will remain with you long after you close the book's pages.... Part of what makes "Evicted" remarkable  and one advantage ethnography often has over journalism  is research like this that it intertwines with the narrative.... Rare are the footnotes in a book so important as they are here  indeed, the statistics and references to journal articles almost form a book unto themselves, an academic study that accompanies "Evicted."... Desmond's meticulousness shows how precision is not at odds with compassionate storytelling of the underprivileged. Indeed, is the respect that "Evicted" shows for its characters' flaws and mistakes that makes the book impossible to forget. Desmond is an academic who teaches at Harvard  a sociologist or, you could say, an ethnographer. But I would like to claim him as a journalist too, and one who, like Katherine Boo in her study of a Mumbai slum, has set a new standard for reporting on poverty.... Eviction itself provides the dramatic punctuation in Desmond's story. Desmond, a Harvard sociologist and preacher's son who writes with a moralistic fervor, makes a persuasive case that unprecedented instability in the rental housing market is at the root of poverty and inequality in America's inner cities.... With a relentless realism, Desmond returns to the speed and violence of the eviction process itself  a subject that elicits his most evocative writing. "Evicted" should provoke extensive public policy discussions. 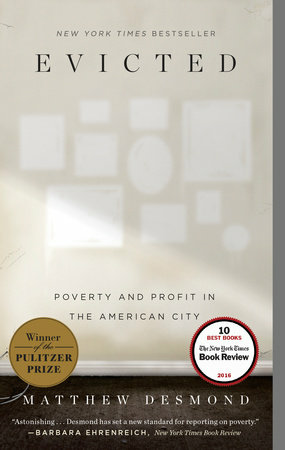 It is a magnificent, richly textured book with a Tolstoyan approach: telling it like it is but with underlying compassion and a respect for the humanity of each character, major or minor.... [T]he stories [Desmond] tells in this book persuasively argue that poverty-related evictions destabilize not only families, but also communities. As Mr. Desmond points out, eviction has been neglected by urban sociologists, so his account fills a gap. His methodology is scrupulous: He documents all his observations and employed a fact checker to verify every detail. Unfortunately, the tone of the book often resembles that of less scholarly chroniclers of urban misery, such as Jonathan Kozol. "Evicted" is chock-full of painful detail to the point of being depressing, an effect amplified by Mr. Desmond's sometimes overwritten prose.... The reader comes away from "Eviction" persuaded that extreme urban poverty makes for intolerable conditions. But the questions of how far the profit motive can be moderated without perverse consequences and how much personal responsibility can realistically be expected of the poor are far from settled. Evicted is a regal hybrid of ethnography and policy reporting. It follows the lives of eight families in Milwaukee, some black and some white, all several leagues below the poverty line.... The result is an exhaustively researched, vividly realized and, above all, unignorable book  after Evicted, it will no longer be possible to have a serious discussion about poverty without having a serious discussion about housing.... What makes Evicted so eye-opening and original is its emphasis. Most examinations of the poorest poor look at those in public housing, not those who've been brutally cast into the private rental market. Yet this is precisely where most of the impoverished must live.... Evicted is most memorable for its characters, rendered in such high-resolution detail that their ghost images linger if you shut your eyes.